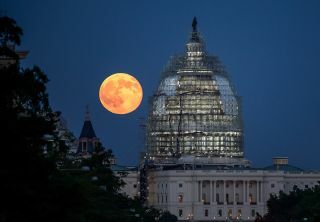 A "supermoon" full moon rises over the U.S. Capitol Building in this NASA photo captured on July 31, 2015. The closest supermoon full moon since 1948 will rise on Monday, Nov. 14, 2016. November's full moon on Monday (Nov. 14) will be the biggest and brightest one since 1948, making it a great time to get outside and marvel at the lunar sight for stargazers around the world. But if it happens to be cloudy in your area, don't despair. You can still watch the so-called "supermoon" online in several live webcasts, starting tonight (Nov. 13). A comparison of the Moon at perigee (its closest to Earth, at left) and at apogee (its farthest from us). The change in distance makes the full Moon look 14% larger at perigee than at apogee. and nearly 30% brighter. The first webcast here is from astronomy broadcasting service Slooh, which will start Sunday (Nov. 13) at 8 p.m. EST (0100 GMT Monday, Nov. 14). You can also watch the supermoon live on Space.com, courtesy of Slooh. The show will take place live from Slooh's flagship observatory at the Institute of Astrophysics of the Canary Islands, where Slooh has telescopes operated by members. During the broadcast, Slooh's chief astronomical officer Paul Cox and Bob Berman, astronomy editor for The Old Farmer's Almanac, will talk about how the full moon grows and shrinks throughout the year. Later, Janice Stillman -- the editor of The Old Farmer's Almanac -- will discuss history and folklore concerning the November full moon from Native American tribes and early American colonists. Viewers can take part by commenting on @Slooh on Twitter, on a Facebook live video, or on a live chat on Slooh.com. A second livestream will show the moon live from Baraket Observatory's dome in Israel, where the supermoon will rise above the Judaean Mountains. That broadcast will start 9:50 a.m. EST (1450 GMT) on Monday (Nov. 14). The supermoon will also be broadcast live from Italy through the Virtual Telescope Project. Starting Monday at 11 a.m. EST (1600 GMT), Gianluca Masi will show the moon rising above the skyline of Rome.